Road – The A21 connects Hastings to London and the M25. The A259 links Hastings to Brighton, Ashford, the Channel Tunnel, ferry ports and the M20. Rail – Frequent trains run between Hastings and Charing Cross, Waterloo East, London Bridge and Victoria (from 81mins). There’s a commuter service to Cannon Street and a line along the south coast connecting to Brighton and Ashford. Hastings’ main rail station is just two minutes’ walk from Priory Quarter. 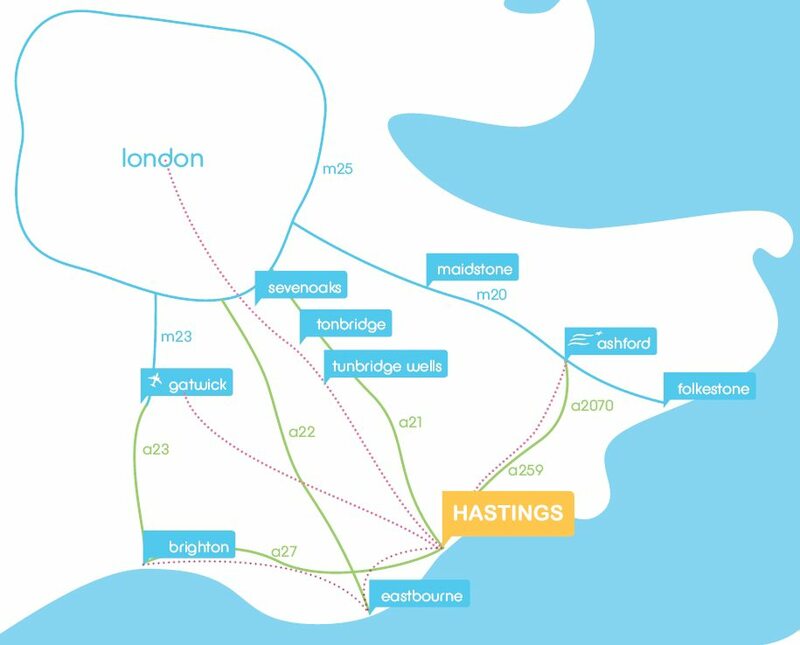 Air – Gatwick is on a direct rail line to Hastings (from 88mins) and 62 miles away by road. Ferry – Hastings is ideally situated for the cross channel ferries: Newhaven (31 miles), Dover (52 miles). Channel Tunnel – You can travel between Hastings and Paris, Brussels or Lille by train via Ashford International, with frequent services connecting Hastings and Ashford in 41mins.